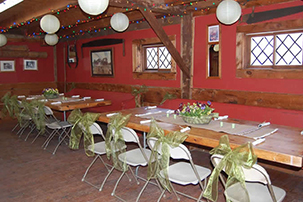 Our party room and related activities allow families to enjoy celebrating milestones and joys in a unique, farm setting. Birthday parties, anniversaries, family reunions--all types of celebrations--are more festive in our unique, farm setting. Bring your decorations, gifts, food/drinks and desserts to our rustic and charming party room and create your own farm party. Individual table rental is $20 per table/per hour plus $6 Petting Zoo admission per person. Half of the pavilion rental is $200 and includes Petting Zoo admission for up to 50 people and use of 4 table for two hours. And don’t forget, you can add a private, tractor-drawn hayride or private pony rides for your group for $75 each.